For other uses, see Waxhaw. Waxhaws is a geographical area on the border of North and South Carolina. The Waxhaws are located in the piedmont region of North and South Carolina, southwest of the Uwharrie Mountains. The region encompasses an area just south of Charlotte, North Carolina, to Lancaster, South Carolina; and from Monroe, North Carolina in the east to the Catawba River in the west. The region is generally forested and hilly, but not mountainous. One town in the region has taken on the name, but it is only one site in the region. Originally known as "the Waxhaw Settlement", the area was named for its first inhabitants, the Waxhaw Tribe. The Waxhaw had been almost annihilated by Eurasian infectious diseases they had no immunity to, following their first European contacts. Those that remained were killed or dispersed during the Yamasee War of 1715, which virtually emptied the area of its Native American inhabitants. Around the year 1740, Scots-Irish and German immigrants began to move into the Waxhaws and establish farms. What is now the Old Waxhaw Presbyterian Church was built in 1752. The region's most important battle of the Revolution did not involve locals. 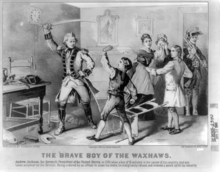 In what became called the Waxhaw massacre, a Loyalist cavalry force led by Banastre Tarleton easily defeated a force of about 350 Virginian Continentals under Abraham Buford, many of whom were killed as they were trying to surrender. The actual battle site is now the town of Buford, South Carolina. Andrew Jackson, 7th President of the United States, was born and raised in the Waxhaws. The exact site of his birth is uncertain; Jackson claimed that it was in a cabin on the South Carolina side of the border. A strong local tradition says that he was born north of the border. James K. Polk, the 11th President of the United States, was also born in the Waxhaws district, in what is now Pineville, North Carolina. During the American Civil War, Major General William Tecumseh Sherman's army came through parts of the region. The Belk department store chain was founded in 1888 in Monroe, North Carolina. ^ a b c "Museum of the Waxhaws and Andrew Jackson Memorial". Archived from the original on 2007-09-10. Retrieved 2008-01-13. ^ Louise Pettus. "The Buford Massacre". This page was last edited on 7 March 2019, at 21:00 (UTC).